The dust and debris which composed my cloud consisted mainly of the disapproval and judgment I felt (some real, some imagined) from other people. The enemy would toss in his own dirt clods of accusation from time to time, and would further pollute the cloud with the suffocating smog of condemnation. 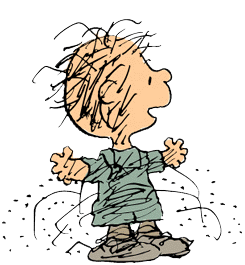 Feelings of unworthiness, discouragement and defeat bounced around me like Pigpen’s ever present dust storm. But the following story, by pastor and author Ken Blue, was the ray of truth that finally penetrated the toxic cloud and caused it to disperse. I pray it speaks to anyone who may feel hemmed in by a similar cloud. The scorched place is the safe place. Jesus experienced and endured the searing heat of judgment to shield us from it. When we stand in the shadow of the cross, condemnation can no longer cast its dark shadow over our lives. Nothing can touch the one who is in Christ. The clouds of condemnation still occasionally threaten to gather. But when they do, I merely point to the blackened ground beneath my feet, and take my place at the foot of the cross. The clouds quickly dissipate in the radiance of the Son.